If you have suggestions or problems with the website please contact Tam Tran at info@tamthientran.com. question 07: how is history made active? A building is typically designed as a single organism. Body parts, organ groups, infrastructural systems that all perform in a specific way that services the organism. But, as with all life, those parts and groups and systems fail, and the organism dies. But sometimes a building becomes a species. And, you know, Charles Darwin has this theory that species evolve because of adaptation. Wikipedia says adaptation is the evolutionary process whereby a population becomes better suited to its habitat. The coliseum was born as an amphitheatre. A great stadium. Various external forces prompted it to become a place of worship, and then a cemetery, and then the walls of a housing community. And like a real species, it listened. It kept breathing, and it adapted. Today the sun shines on a tourist attraction where a great stadium once stood. Because today, the external forces told it that Rome was changing, and it needed to change too. But its current life, though less performative than in the past, does not mean it’s dying. 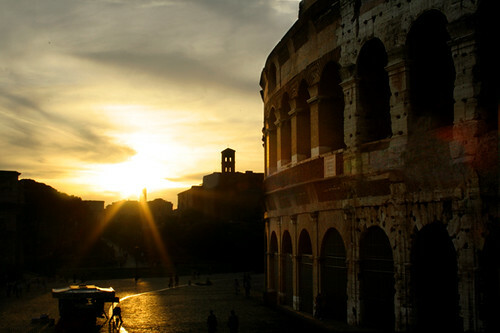 Because someday in the future, external forces will tell it that Rome is changing, and that it needs to change too.